Spring is chiseling mud off the bottom of school shoes on Monday morning before school. When mud calls, little boys go running…missing play shoes be damned. Time to bring the rubber boots out of winter storage. You should have that photo framed, it looks so vintage. Kris – you do have a point ;)PF – thanks! 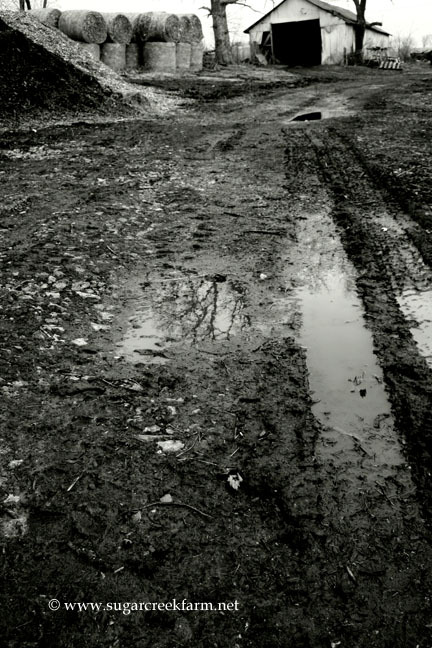 The mud is a little easier to take when it’s all artistic like this :)Patti – glad mine isn’t the only one! Love your mud shot! I keep thinking of taking a photo of the mud in our farmyard, but then I always change my mind right away. Looks like b&w is the way to go. Maybe I will try it sometime.